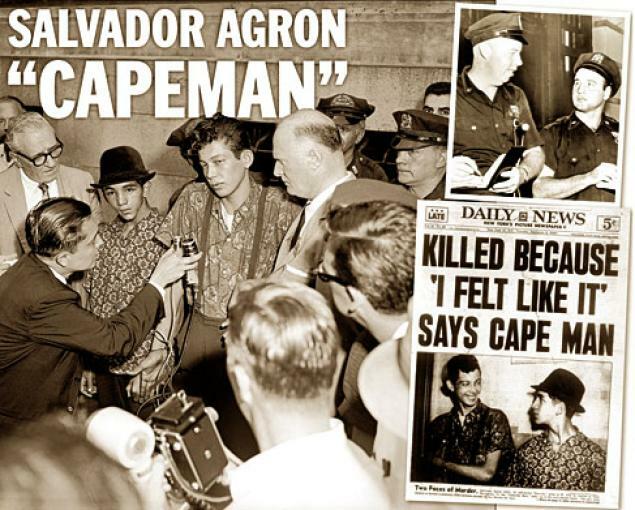 After the two murders in the Hell’s Kitchen Park on the evening of August 30, 1959, Salvador Agron and Louis Hernandez were not apprehended by police right away. They fled to the Bronx where they hid for awhile until they were eventually captured a few days later. During this time, the newspapers had been reporting heavily on the sensational news of the two boys killed in this gang murder. With the arrest of Sal, they had someone to put their sights on even though four other defendants had already been arrested. Sal didn’t disappoint — he was combative with the press and said things that newspaper editors dream about in order to sell more newspapers. For example, Sal was quoted as saying, “I don’t care if I burn, my mother could watch me.” Click here to see video footage of Salvador Agron taken by the press in 1959.